(Stillness in the Storm Editor) Longtime readers of this site will recognize the emphasis on critical thinking, self-mastery, and holistic discernment. Edward Snowden's remarks regarding so-called fake news are reflective of someone who acknowledges the core problem we face in the age of deception. The solution to disinformation, whether from government propaganda sites and the mainstream media, online trolls, deceptive people, or even those in the alternative media who aren't adept at fact-checking, is critical thinking. This is because it is a lack of critical thinking—or discernment in general—that allows gullibility to run rampant. Ignorance of the people is the foundation for despotic societies and tyrannical governments. Only when each individual recognizes their inherent right and duty to seek the truth can freedom for all be realized. Discernment and critical thinking are skills that require practice and refinement. One cannot discern what has been erased from reality via well-intentioned censorship schemes, whether promoted by the government or local level reality filtration, such as schools, Facebook groups, communities, and even in the family environment. The problem is, we've become so dependent on arbiters of truth, our minds have essentially become calcified and have gone unused. Thus, the solution, as Snowden implies, is to do the personal work of enhancing our critical thinking skills. This can't be done in a sanitized environment. It has to happen in a natural setting. In short, censorship is never helpful for instilling critical thinking and discernment. Consider this scenario. A cable is left in a hallway of a home. A child walks across it and trips, not noticing the obstruction in their path. There are two general solutions to this dilemma. One imparts greater skills and empowerment on to the child, the other does not. On the one hand, we could remove the cord from the hallway so that the child doesn't trip anymore. On the other hand, we could leave the cord there and encourage the child to be more careful and be aware of their steps. In the latter case, the risk of the child tripping is still present, but after a time of learning and adjustment, they gain more skill in navigating with their bodily vehicle. Removing the cord limits risk, but it also eliminates the opportunity for growth. Yes, the child might not trip in the house, but they will likely encounter other situations in life wherein the risks and perils of experience cannot be avoided. Except now, they won't have the chance to develop those skills in the safety of the home. Similarly, discernment and critical thinking are skill developed in an environment of risk. We might judge incorrectly; we might make mistakes. But the rewards of discernment are life long once we learn to navigate risk. Conversely, if an environment is "sanitized" of information via arbiters of truth, the risk of being wrong may be avoided—assuming that these priests of truth are honest and accurate—but the cost will be monumental. What's better: to have a child with a strong immune system who has suffered the trials of life for their own empowerment, or a child who is sheltered from the world, a delicate, fragile thing easily made sick when coming in contact with pathogens. If the biological immune system is improved by exposure to pathogens, then the intellectual immune system similarly requires exposure to "toxic" or false ideas. As individuals, we must be proactive in exercising our discernment and critical thinking by exploring the unknown and the uncertain as a child explores their environment. And like any skill, mistakes, folly and missteps are sure to occur. But this is par for the course, an essential part of the learning process—not something to be avoided. In our result-centric world, we've become so focused on being "right" that we forget the benefits of being wrong. A musician can't improve their skills unless they make an attempt to play new things. In doing so, they reveal their inadequacies and lack of development, providing an experiential basis to focus their attention on areas where improvement is needed. Similarly, in our desire to know the truth, whether we are avid truth seekers or unaware, we must bravely think about the information we are exposed to, asking ourselves if something is true, and most importantly why. Critical thinking and holistic discernment go beyond a shallow yes or no answer. We must seek to plumb the depths of experience and weave a fabric of fundamental understanding. To one who wields holistic discernment properly, they know whether or not something is true, have a precise understanding as to why, and most importantly, recognize the limits of their own knowledge. In other words, critical thinking is a dynamic evolution of consciousness, the more we practice it, the better we get at seeing reality for what it is. Ultimately, the more keenly we develop these essential skills, the more immune we become to falsehoods of all types and the more of reality we can perceive directly. Snowden's statements should be contemplated fully. And for those of us experiencing the awakening of humanity at this time, we would do well to realize that censorship in any form is not productive. The truther movement is not immune to censorship—it is likely happening within all awakening circles to some degree. There are many who feel disinformation should be ignored and erased, but how can we develop intellectual immunity in such a setting? Instead of trying to avoid lies, disinformation, and half-truths—which is impossible on Earth at this time—we need to bravely think critially and gain knowledge that empowers us to see past the illusions of our world, laying claim to the whole truth in the process. Once done, we no longer need others to tell us what is real; we can see the truth for ourselves. Hence, gaining critical thinking skills is akin to learning how to fish—we are fed for a lifetime instead of only for one meal. We cannot delegate critical thinking to others, if we do, we downplay our own empowerment and invite more enslavement. Instead, we must become masters of discernment, wherein we do not shy away from the dance floor of truth seeking. The masters of deception want us to run away in fear and clamor for "saviors" to tell us what is real or not. But the wise realize that the only way out is through. Critical thinking empowers us to see things for what they are, consequently empowering us to see what they are not—meaning seeing past lies, falsehood and so called fake news. 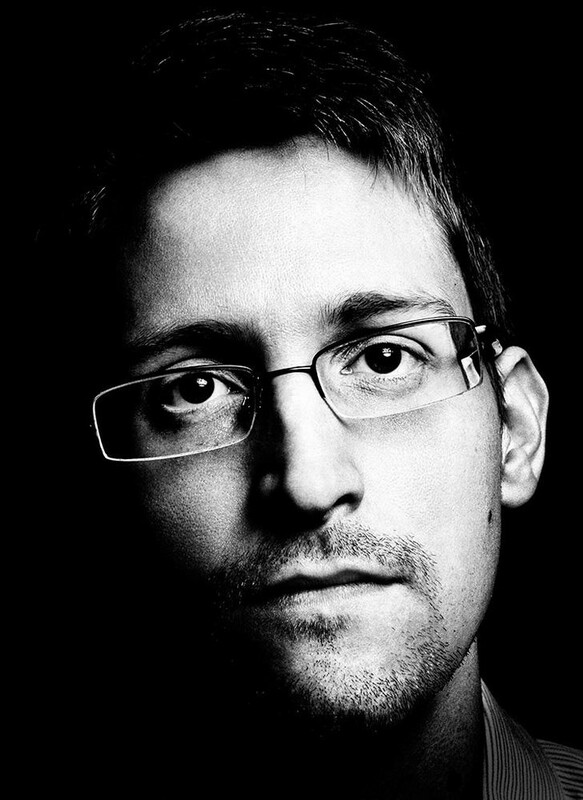 (Caleb Stephen) In a recent Periscope live stream, NSA whistleblower Edward Snowden discussed the topic of “fake news” as supposedly helping to sway the U.S. presidential election with Twitter CEO Jack Dorsey. 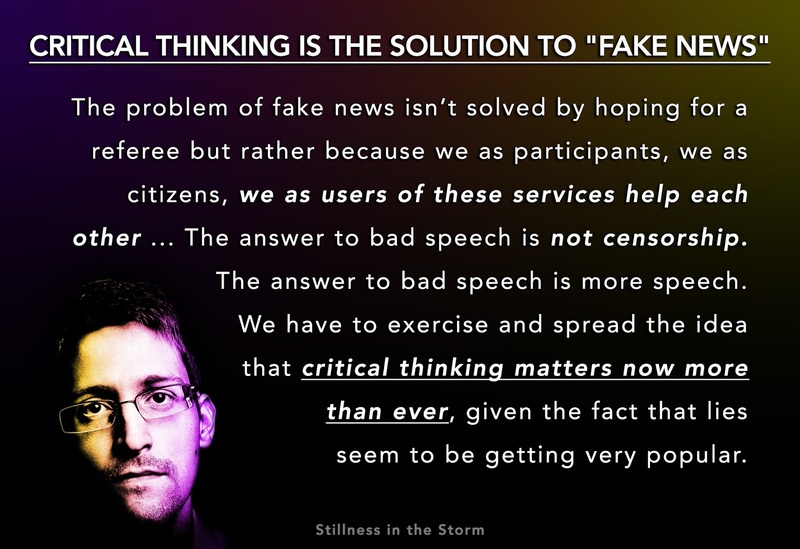 Snowden said that the solution to “fake news” was not censorship, but rather critical thinking. This discussion comes after Facebook announced that it would be partnering with ABC News, Politifact and Snopes to assist with the debunking and labelling of so-called “fake news” stories on their social networking platform. Snowden made no mention of whether or not he believed the claims—pushed by the likes of Hillary Clinton and her supporters—that “fake news” had swung the election in Donald Trump’s favor, but rather pointed out the dangers of companies using terms such as “fake news” to censor content with which they disagreed. Snowden stated that rather than waiting for gatekeepers to define what is and is not “fake news,” people should be encouraged to participate in an open dialogue with one another and point out facts based upon proven data. You can watch a replay of Snowden’s full interview with Jack Dorsey here. Caleb Stephen is a Christian conservative freelance journalist, columnist, political activist and the founder and Editor-In-Chief of The Caleb Report (www.calebreport.com).